The People's Protection Units / Popular Protection Units [Yekîneyên Parastina Gel = YPG] is the armed wing of the Syrian Kurdish Democratic Union Party (PYD). The YPG said it had 50,000 fighters as of mid-2014, though independent estimates placed the number at around 30,000. By 2016 one estimate placed YPG streanth at about 65,00 combatants. The YPG said it should be a natural partner in a coalition the United States is trying to assemble to fight Islamic State militants. This Kurdish militia group is active in areas in Syria that are predominantly inhabited by Kurds, mostly in the northeast. The PKK sent some of its militants to Kobani in 2014 after Islamic State attacks. Not too much is known about the YPG, which was formed after the Qamishli uprising in 2004, when thousands of PYD members and followers were arrested and subjected to the most severe types of torture in the notorious dungeons of the Syrian intelligence services. On 14 January 2017 the US-led international coalition against Daesh announced that it would establish a 30,000-strong new border security force with the SDF – the US-backed group, largely controlled and manned by the YPG, Turkey considers it as the Syrian wing of PKK terrorist organisation. The new "Border Security Force" would be deployed at the borders of the area controlled by the Syrian Democratic Forces (SDF). About half the force will be SDF veterans, and recruiting for the other half was underway by January 2018. The base of the new force is essentially a realignment of approximately 15,000 members of the SDF to a new mission in the Border Security Force as their actions against ISIS draw to a close. The force would deploy along the border with Turkey to the north, the Iraqi border to the southeast, and along the Euphrates River Valley, which is the dividing line between the US-backed SDF and Syrian government forces backed by Iran and Russia. The ethnic composition of the force will be relative to the areas in which they serve. More Kurds would serve in the areas in northern Syria. More Arabs would serve in areas along the Euphrates River Valley and along the border with Iraq to the south. The Turkish president on 16 January 2017 stepped up threats to launch a cross-border operation against the Syrian Kurdish militia known as the YPG, which the US backed in the war against Islamic State militants. Ankara sees the YPG as a terrorist organization linked to an ongoing Kurdish insurgency in Turkey. Erdogan used his weekly parliamentary address to his ruling AK Party supporters to say the operation could be imminent. "Tomorrow, or the day after, or within a short period, we will get rid of terror nests one by one in Syria, starting with Afrin and Manbij," Erdogan said. Russian Foreign Minister Sergei Lavrov says US plans to establish 30,000-strong new border security force led by YPG militants could jeopardise Syria's territorial integrity. Speaking at his annual news conference in Moscow, Sergei Lavrov the US plan could cause problems for Turkey. “The US’ unilateral, ultimatum-like project, aimed at establishing an army in Syria, may create problems in relations between Turkey and Kurds,” Lavrov said. Lavrov also said the US move “can’t serve to calm the situation” in Syria’s Afrin district, which borders Turkey, adding that Russia expects Washington to explain its move. Turkey and some members of the FSA accuse the PYD and YPG of being a front for the Kurdistan Workers Party (PKK). While in the past the YPG had close ties to the Democratic Union Party (PYD), by 2014 the YPG’s leadership was trying to position itself as a pan-ethnic organization that was the defender of all of the region’s communities—both from the al-Assad government and the Salafi-jihadi organizations that are trying to impose an Islamic state on Syria. YPG leaders also insist that the organization is a-political and subsumes itself under the Supreme Kurdish Committee, which includes the PYD and the umbrella organization the Kurdish National Council (KNC) that is close to KRG President Massoud Barzani. Much of the strength of the emerging Kurdish political power comes from the YPG militias who control three enclaves – Afrin, Ayn al-Arab and Hasakah province - along Syria’s northern borders. These enclaves enable them to recruit and levy taxes on oil shipments crossing the Syrian border, where they continue to clash with Jabhat al-Nursa units for nearby border crossings. Control over al -Hasakah Province, which has an ethnic Kurdish plurality, is important to the Kurds who are seeking greater autonomy and self-rule from the Syrian state. Al-Hasakah’s oil resources are also important and a source of frequent conflict between Arab and Kurdish armed groups. 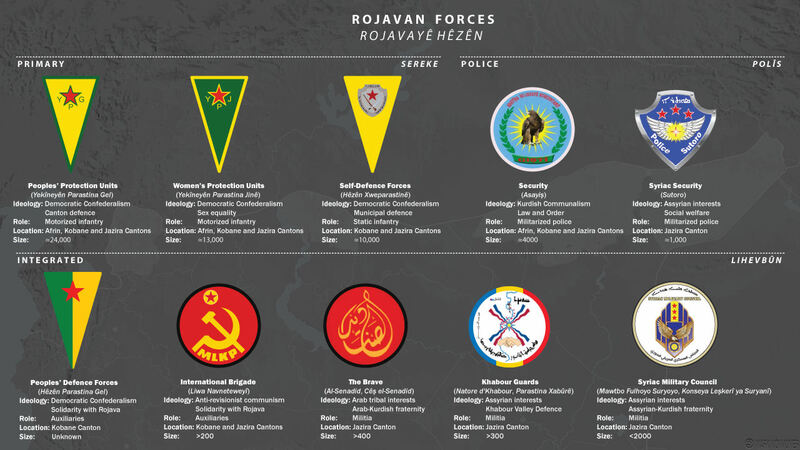 The YPG describes itself as "a national legitimate, multi-ethnic and multi-nationality military institution of sons and daughters of the components of the region, the Kurds, Arabs, Syrians, Assyrians, Turkoman and Armenians, who adopt the right of legitimate self-defence in accordance with international laws. YPG’s mission is to protect Western Kurdistan and all its ethnic, national, and religious components, and to provide security and safety to citizens wherever they are; to deter any military force aimed at de-stabilizing civil peace and stability; it pledges to defend the gains and the values of freedom and social democracy, and the legitimate aspirations of the Kurdish and Syrian people in their revolution against dictatorship and the forces of terror and darkness. "... it is unacceptable for anyone under the legal age to join in the ranks of the YPG and it is prohibited by the principles upon which these units have been built, and also against the rules of its Constitution and the foundations which are the basis upon which volunteers join up. This means that recruitment of children under the legal age is rejected completely and in principle; the rules and regulations in force in this area prohibit any such action, and there are clear peremptory decisions taken at official meetings of these units and its conferences preventing such practices, and to confirm the penalties for any offenders. All this did not prevent the emergence of such things and a few who are under the legal age did join on a voluntary basis under the pressure of circumstances, and through the neglect of some, although they were not allowed to participate in military operations or to stay near active battle." No other ethnic or religious group in Syria’s brutal two-and-half year civil war has fielded so many female fighters. Twenty percent of the Kurdish warriors grouped together in the People’s Protection Units are women. And Kurdish women - in increasing numbers - joined internal security and police units tasked with maintaining law and order, guarding checkpoints and strategic buildings from jihadists and radical Islamists. Female recruits for either frontline YPG groups or internal security units go through a month's basic training - normally at a camp in the town of Afrin. Female Kurdish fighters ignite fear into Islamic State militants, who believe that they’ll go straight to hell if they are killed by a woman. Ain al-Arab and the surrounding areas fell under Kurdish control a year into the uprising against President Bashar al-Assad. Ain al-Arab [aka Kobani] was the only part of a 300 km (190 mile) section of the border with Turkey not controlled by the Islamic State. By late 2013, while militiamen in the People’s Defense Units proved increasingly successful against al-Qaida affiliates on the battlefield, they were at a loss about how to combat a burgeoning jihadist car and suicide bombing campaign. Since the summer of 2013, there had been some 40 bombings, including two suicide attacks. At least 30 people have been killed and dozens wounded. Several bombings were in the town of Kobani near the Turkish border. At checkpoints outside Kurdish-controlled towns and villages, it is difficult for untrained defense volunteers to identify threats, such as knowing where to look for bombs in cargoes of fruit and vegetables. Many Kurds do not object to YPG’s repressive tactics because some are afraid. Others are silent because a lot of Kurds have the opinion that being persecuted by Kurds is better than being persecuted by Arabs. The YPG militias have earned a reputation for destroying community centers, civil society offices and headquarters of the political opposition in the region, said Savelsberg. In June 2014 armed YPG forces attacked a street demonstration in Amuda, killing six activists and wounding dozens more, drawing international protest. Syrian Kurdish fighters from the People's Protection Units clashed with IS fighters along the border with Iraq and Turkey. Armed violence flared in Kurdish areas in the north-east in 2013, where the role of local militias in the conflict grew. Prioritizing their neutrality and the protection of Kurdish localities, the People’s Protection Units clashed with both government forces and anti-government armed groups. YPG forces in early August 2014 established security corridors along the Iraqi border, enabling some refugees fleeing IS violence in Iraq to cross into Kurdish-held areas of Syria. Displaced people from the Yazidi religious minority were evacuated from Mount Sinjar with the help of members of the Kurdish People's Protection Units (YPG), as they made their way towards Newrooz camp, in Syria's al-Hasakah province. The People’s Protection Unit announced 23 September 2014 statistics from the week’s clashes with Islamic State militants in Kobani, in Syrian Kurdistan. The YPG’s press unit have revealed that is has killed 232 IS militants, in this past week’s clash in northern Syria. “32 YPG and Women’s Protection Unit (YPJ)fighters have also been killed,” the statistics show. “We have taken control of a huge amount of IS’s heavy and medium weaponry, and we have destroyed IS tanks and vehicles,” continued the report. The spokesperson of the People’s Protection Units Redur Xelil called 25 September 2014 for US airstrikes against the Islamic State terrorist group after the YPG failed to stop advances of the Sunni terrorists that are attacking the Kurdish town of Kobani. “The people and our units are defending Kobani with light weapons and almost no resources at all against one of the most brutal attacks by IS,” said Xelil. “The airstrikes on IS bases by the U.S. and their alliances was of great importance and really necessary, although it came late,” added Xelil. 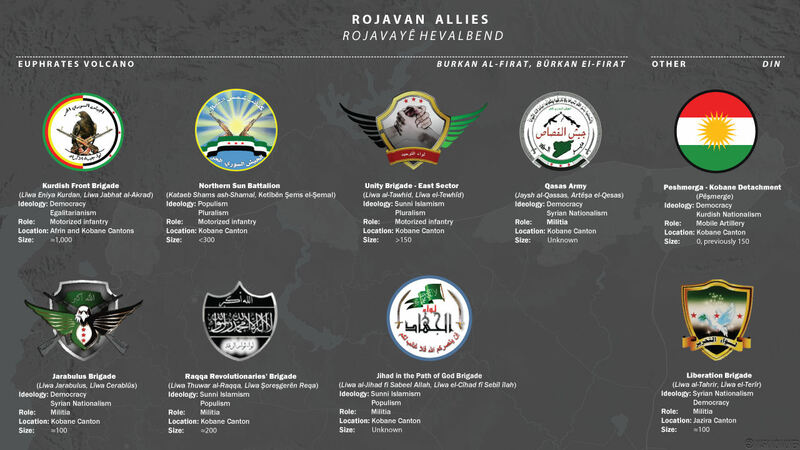 The Kurdish People’s Protection Units, and the main Syrian Opposition force, The Free Syrian Army (FSA, announced 28 September 2014 an agreement to fight Islamic State (IS) militants together in Syrian Kurdistan. Islamic State fighters backed by tanks captured 21 Kurdish villages in Northern Iraq near the Turkish border September 19, 2014 in 24 hours. According to British-based Syria Observatory for Human Rights, the militant Since Wednesday, Islamic State militants appear to have gained the upper hand in Syria's northern Kurdish region of Kobani, also known as Ayn Arab, overrunning 21 Kurdish villages, according to the Britain-based Syrian Observatory for Human Rights. ISIL attacked with American tanks and heavy weapons that they captured in Mosul. Irregular armed forces have to rely on their ingenuity to arm themselves. And while rifles and mortars can be bought on the black market, getting hold of tanks or armored fighting vehicles can be a bit tricky. People's Protection Units are mostly armed with small arms, with some heavier weapons such as mortars and rocket launchers, pickup trucks turned into mobile gun turrets and an occasional piece of artillery. The up-armored cars and tracked vehicles may look like cast-offs from Tatooine desert scenes of Star Wars or Mad Max and the Thunderdome, but with proper employment they may be no less efficient in battle than the early tanks of the Great War were on European battlefields. Kurdish fighters took control of the long-besieged Syrian town of Kobani 26 January 2015 after months of fighting Islamic State militants, though the Pentagon declined to declare the battle over. The Britain-based Syrian Observatory for Human Rights and senior Kurdish official Idris Nassan said Syrian Kurdish YPG forces and Iraqi Kurdish forces known as peshmerga had retaken Kobani, also known as Ayn al-Arab. The city had become a symbol of the battle against the Sunni Muslim insurgents who captured huge swathes of Iraq and Syria over the past year. Nearly 1,000 Iraqi Kurdish Peshmerga fighters have been killed fighting the Islamic State jihadist group since June, AFP reported 04 February 2015. Jabbar Yawar, the secretary general of the ministry responsible for the Peshmerga, said that 999 Kurdish fighters were killed and 4,569 wounded between June 10 and February 3. Previous casualty figures released on December 10 put the toll at 727 killed and 3,564 wounded. Syrian Kurd YPG forces had until early 2016 been a key US ally in the fight against Islamic State. By mid-February 2016 other rebel groups accused the Syrian Kurds of shifting tactics, lessening their focus on Islamic State to instead seize territory once held by various opposition groups. They accused the Kurds of working in coordination with both the Assad regime and Russian air power. Syrian government warplanes on 18 August 2016 bombed Kurdish-controlled areas of the city of Hasaka in northeastern Syria for the first time in the five-year-old civil war, the spokesman for the Syrian Kurdish YPG militia and a monitoring group said. YPG spokesman Redur Xelil said the air strikes had hit Kurdish districts of the city, which is mostly controlled by Kurdish groups, and the positions of a Kurdish security force known as the Asayish. "There are martyrs and wounded," he told Reuters.